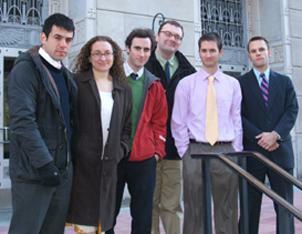 When the animal rights group Stop Huntingdon Animal Cruelty (SHAC) posted news of both legal and illegal conduct on its website, and publicly supported a variety of tactics in the movement to shut down the notorious animal testing lab Huntingdon Life Sciences, they were acting as “generals” in a campaign of “terrorism,” the U.S. government argued before the Third Circuit Court of Appeals last Tuesday. It doesn’t matter that the defendants, dubbed the SHAC 7, were never accused of breaking windows or gluing looks. It doesn’t matter that they were never accused of any act of physical violence. It doesn’t matter that they only endorsed a variety of tactics in words, speeches, and media interviews. Although the defense attorneys and two defendants who attended the appeal said the judges seemed to lean in their favor on a few key issues, the decision of the three-judge panel will probably not be released for at least 3-6 months, perhaps even longer. Instead of recreating the step-by-step process of the appeal, here’s a look at some of the key arguments made by the government and the defense. Soon after the SHAC 7 were convicted of “animal enterprise terrorism,” corporations and the politicians that represent them rushed through new federal legislation called the Animal Enterprise Terrorism Act. Although the existing law, the Animal Enterprise Protection Act, had just been used to convict these animal rights activists for running a website, supporters argued that the government’s hands were tied in cases like this. The defense argued that it’s possible the SHAC 7 could have been convicted under the new law, but the previous law simply wasn’t broad enough. The new law could wrap in the loss of profits as “terrorism,” but the language in the previous law is more specific, focused on physical damage to physical property. “What was lost was not something they used, but something [the corporations] wanted to have, which is profits,” Goldberger said. But Judge Fisher said to Robert Stahl, a defense attorney, that the fact that the Animal Enterprise Terrorism Act was more specific doesn’t mean the previous statute isn’t applicable. The first statements were made by the defense attorneys, but it didn’t take long for judges to begin interrupting, as they tend to do, and shifting the discussion. “Do you think posting addresses and information on children is appropriate?” Judge Fuentes asked H. Louis Sirkin. “Some of that did happen,” Sirkin said. In any social movements, there are situations where some individuals go too far, he said. But the defendants only posted news of this received in anonymous communiqués, they did not endorse or incite such activity. And that point, incitement, is why this extremely controversial speech is still protected under Brandenburg. Those postings were a “product of the name and shame game,” Stahl said, and intended to out corporations with ties to the notorious lab. No, Stahl said. There’s no evidence of that, there were no demonstrations at schools, no child was approached by an activist. What the defense attorneys never mention, one of the SHAC defendants said afterwards, is that the personal information wasn’t posted because of any campaign strategy. It was posted because the group made a conscious decision to post every communiqué received, regardless of their personal views. They put all of the information out there, without censoring. Throughout history, in every single social movement, there has been a diversity of tactics. Some people leaflet or lobby members of Congress. Some people break windows or throw Molotov cocktails. All in the name of the same cause. The government, though, argued that vocally supporting illegal conduct–through words, not action–is tantamount to “embracing” those crimes, and is not protected speech. While many in the animal rights, environmental and other social justice movements can see the difference between someone who sneaks out to break windows at a McDonalds, and someone who writes for a pro-Animal Liberation Front website, in the eyes of the government it is all conflated. Evidence of that, Moramarco said, is their use of PGP, an email encryption program. It is “pretty clear they were using PGP when going into their illegal mode,” he said. But, as another attorney said after the hearing: Arguing that encrypting email means you are talking about crime is like arguing that pulling your blinds means you are beating your children. Perhaps the most disturbing element of the appeal was hearing the government speak so candidly and succinctly about what kind of conduct should be prosecuted. Similarly, Josh Harper made two speeches in which he supported the “black fax” tactic. One was to a local group in Seattle, the other was to activists in Little Rock. Those speeches, the government said, are enough for a conviction. Two speeches. Three years in prison.